Structural analysis (FEA), injection-mold analysis, computational fluid dynamics (CFD) and other CAE programs rely on precise representations of material behavior. At DatapointLabs, we have streamlined the art of material modeling for CAE into an efficient process that consistently delivers accurate results. We have developed TestPaks® for your programs in cooperation with leading software vendors. Rely on our expertise to help you select the right material models, generate the right data and get it into your programs, seamlessly. TestPaks® are complete- they contain all the measurements and model fitting needed for your simulation. TestPaks® are cost-effective and easy to order- they are available for most common material models. TestPaks® are self-consistent- properties are generated the same way, every time for a material model. TestPaks® are easy to use- CAE-ready material files are deposited into your Material Card Library at Matereality. Simulations of manufacturing processes such as injection molding, blow molding, and thermoforming require highly complex, non-linear data inputs, including viscosity, thermal properties, PVT, viscoelastic, and mechanical properties. We generate data and analysis-ready material files for all major simulation programs used in the industry today. Simulation of crash and impact phenomena require rate-dependent properties. These are usually stress-strain curves measured over several decades of strain rate. 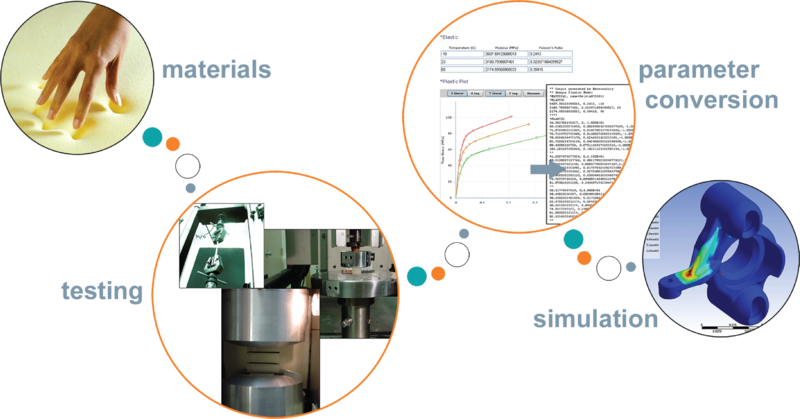 We provide rate-dependent data and parameter conversion for metals, plastics, rubbers and foams, and composites, including more complex experiments to model yield surfaces, advanced plasticity and failure. A hyperelastic material can be thought of as any type of rubbery material that exhibits large recoverable strains up to failure. Because such material is highly deformable and the Poisson’s ratio is nearly 0.5, deforming the material by stretching, compressing, or twisting in one direction results in a large deformation response in other directions. This coupling means that the material behavior cannot be predicted using properties generated in only one mode of deformation. We support all commonly used finiteelement simulations with multi-mode test data, along with fitting to mathematical models such as the Mooney-Rivlin or Ogden equations. Foams are complex materials, the behavior of which can be tailored for the application purpose. The most common mode of deformation is by compression. Foams usually are not strong in tension or shear and are rarely intentionally subjected to deformation in these modes. Our support for foam modeling includes testing for factors such as rate dependency, hyperbolic extrapolation for impact simulation, and hyper-viscoelasticity. The modeling of time-based phenomena is gaining widespread use in industry as analysts try to predict the long term behavior of products. While classical creep experiments remain the mainstay for this kind of analysis, viscoelastic modeling provides predictive advantages at small strains for certain types of materials. Creep rupture experiments are useful to gauge time-dependent failure while cyclic fatigue data are vital to ensure that products do not fail in the field.